Hi Happy Hot July! 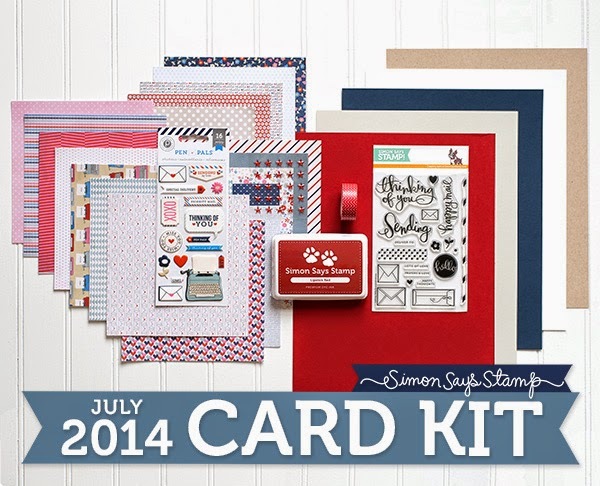 Today I am sharing a few cards that I made with the July Simon Says Stamp Card Kit. I have to say that I think this one is my favorite one yet! The patterned papers are just to die for. The ink...FAB. Just love everything about this kit. I am working on more cards from it today but I couldn't wait to share these 3. So let's get to it. 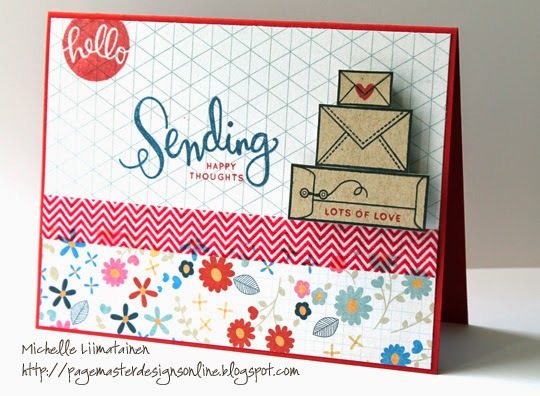 For this one I stamped the little envelopes 3 times on the kraft cardstock in Black Hero Arts ink and added a little red heart and a sentiment stamped in the Lipstick Red SSS ink that is included in the kit. I used Hero Arts Navy to stamp the sentiment. All supplies on this card are in the kit other than the Black Hero Arts ink. For this one I used the remainder of the flowered paper from the first card. I think this is my favorite print out of all of them. I used a Memory Box die to die cut the flower from the first two layers and then die cut it again with the chevron paper from the kit and inlaid it into the flowers. I used the Simon Says Stamp Hello die for my sentiment. My third card I used the Puffy Stickers from the kit. I LOVE these. They are by Pink Paislee. I love the texture of them. They are kind of rubbery and they stick incredibly. I stamped the little flower from the set in Colorbox White Frost pigment ink and then stamped over them with the SSS Lipstick Red, Hero Arts Navy and Hero Arts Cornflower blue. 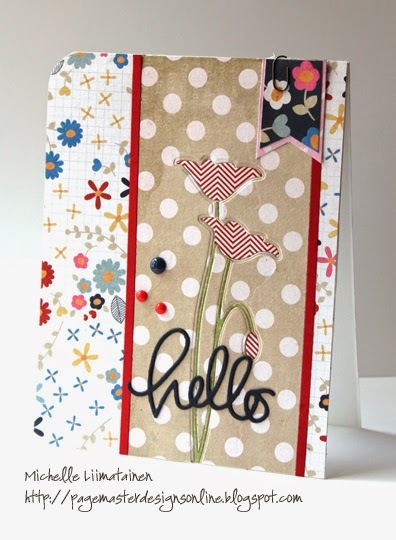 I added some dots and some tick marks around the edge of the tag that I created with the Kraft Cardstock. It was so fast and so simple...one of the reasons I love these kits so very, very much. That's all for today. I am off to create more! If you don't get these kits on a monthly basis, I highly recommend them. You can also buy them each month without a subscription. 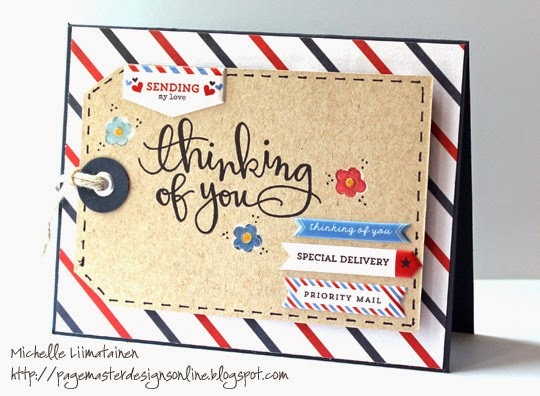 While I am here I thought I would enable you a bit....if you haven't seen...Simon Says Stamps is offering a HUGE savings on Kelly Purkey items right now....75% off...yup 75 PERCENT OFF! Crazy right? Use the Code PURKEY at checkout. 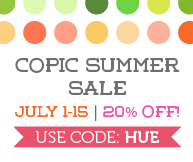 Also, they are having a Copic Sale too!!! *note: I'm struggling with inlinkz right now. I linked it individually in the descriptions.